The Department of Electrical Engineering (EE) currently has 37 full-time faculty members composed of 11 Professors, 17 Associate Professors, 7 Assistant Professors, and 2 Professional Lecturers, of which 31 are Ph.D. holders, and are experienced practitioners with licenses. Faculty members are very actively participates in national competitions and have received more than 100 awards annually for 5 consecutive years including several grand awards. The EE department has undergraduate, master, Ph.D. programs and English-taught programs for international students pursuing master and Ph.D. degrees. The international programs are highly recommended by the Ministry of Education (MOE). The Company, Tainan Spinning Co. Ltd., was established on March 21, 1955. The company primarily manufactures textile products, synthetic fibers and is Taiwan’s largest polyester cotton and spinning mill. Concurrently, it also has the production of the latest equipment and technology for automation machines. Today, the main site in Xinshi has 3 factories and has also established 3 factories in Vietnam. The company has a paid-in capital of NT$16,568,158,570 and is a listed company in the stock market. The company employs 1,872 employees in Taiwan and has 5,411 employees in Vietnam. Provide the students internship opportunities and hire the outstanding graduates as full-time employees. Following the EE goals, the specific education goal of this program is to equip students with international perspectives, language capability, and automation skills to fulfill their responsibility in their careers. 12 credits in general education: including Spoken Chinese, Technical English, Workplace English, and English Training Course. 18 credits in EE and automation core courses: Introduction to Industry 4.0, Electric Circuits, Engineering Mathematics, Control Systems, Dynamics, and Electric Machinery. 18 elective course credits: Computer-Aided Manufacturing Practice, Microprocessor Practice, Computer Graphics and Practice, Electric Circuits Practice, Programmable Logic Controller Applications and Practice, Mechatronics Practice, Intelligent Robot Application Practice, Image Processing Application and Practice, and Motor Theory and Control Practice. 22 internship credits: including 12 months practical internship in the partner enterprise. As of the language requirement for application, applicants should meet the following standard of CEF A2 or equivalent. The program will hire an assistant that is familiar with the Vietnamese mother tongue to reduce the learning and language barriers of the students. At the beginning of the program, there would be beginner’s Chinese conversation, Technical English, and Workplace English classes, to cultivate the Chinese and English skills of the students. 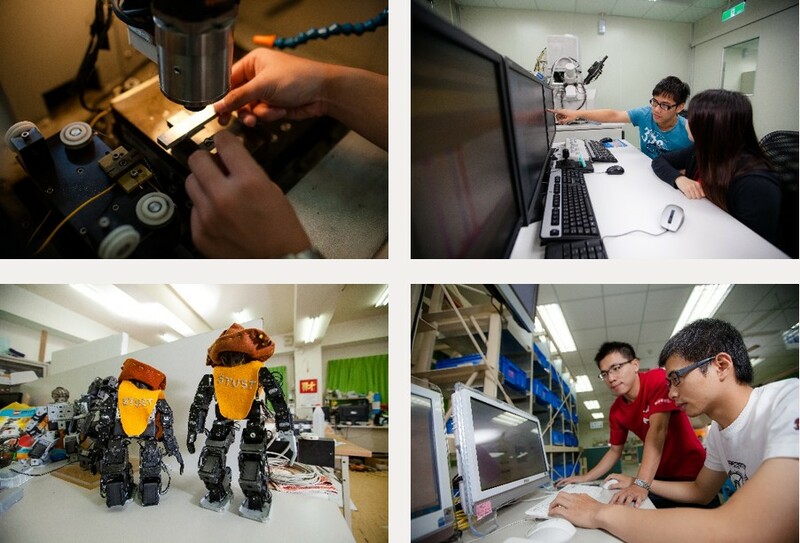 For those who want to experience a wonderful college live, learn automation knowledge and make an automation internship in Taiwan, the International automation program in EE, STUST is your best choice. You are welcome to join our international community.